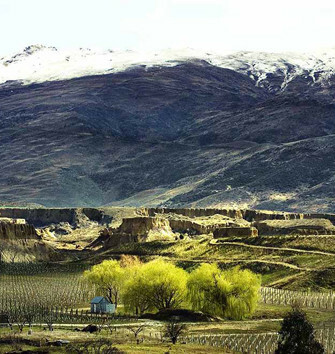 Domain Road Vineyard is located in the heart of the 19th century gold mining area of Bannockburn, which is home to some of the most significant vineyards and wineries in Central Otago. The environmental devastation created by the early gold miners, who literally washed away entire hillsides while sluicing for gold, has inadvertently been a godsend for growing grapes. It left behind good quality loam over free-draining schist gravel and pipeclay, popular with the early miners for making tobacco pipes. Both of these, along with the climate which provides hot summers and cold winters, make for excellent wine-producing grapes. The land surrounding the Domain Road and Defiance Vineyards is a dramatic sight, as they are backed by the mountains of the Carrick Range and Garvie Mountains.